On 28 September 1967 Kesteven County Council – the planning authority at the time – designated an area in Stamford’s historic core as a Conservation Area, the first in the country. The Society decided to commemorate this important occasion by putting on an exhibition at the Arts Centre that explored how and why this happened and why conservation is still important today. The exhibition ran from 20–28 September and was generously supported by Colemans, The George of Stamford, Historic England and the Institute of Historic Building Conservation. 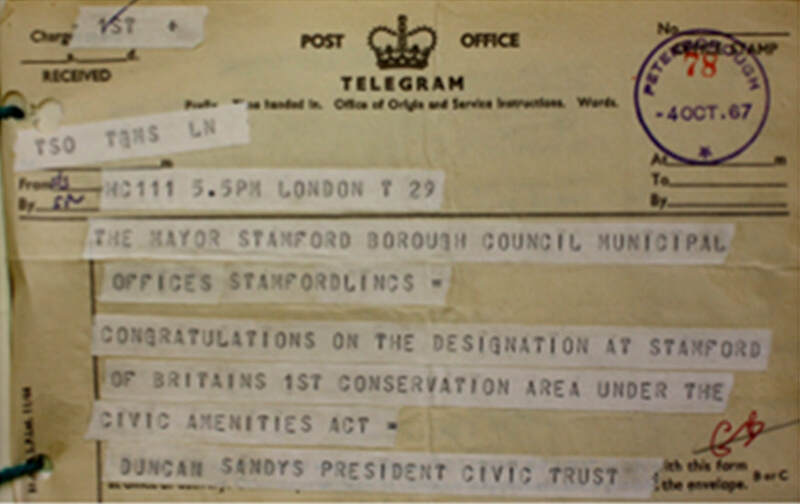 The exhibition illustrated Stamford’s wonderful architectural heritage and highlighted the role of national and local people in tackling the threats to historic environments, prevalent in the 1960s, of rapid development and heavy traffic. Local people contributed their memories of the town before the Conservation Area came into being. Splendid aerial photographs by local photographer David Baxter illustrated the compact nature of the town, surrounded by green meadows and showed areas where development might take place. Accompanying the exhibition were screenings of short films made by students from the Bluecoat School on Stamford boys who served in WW1. This was part of the Stamford Schools Heritage Film Festival. Heritage Lincolnshire invited young people from schools in and around Stamford to produce lms to help share what matters to them about their historic town. 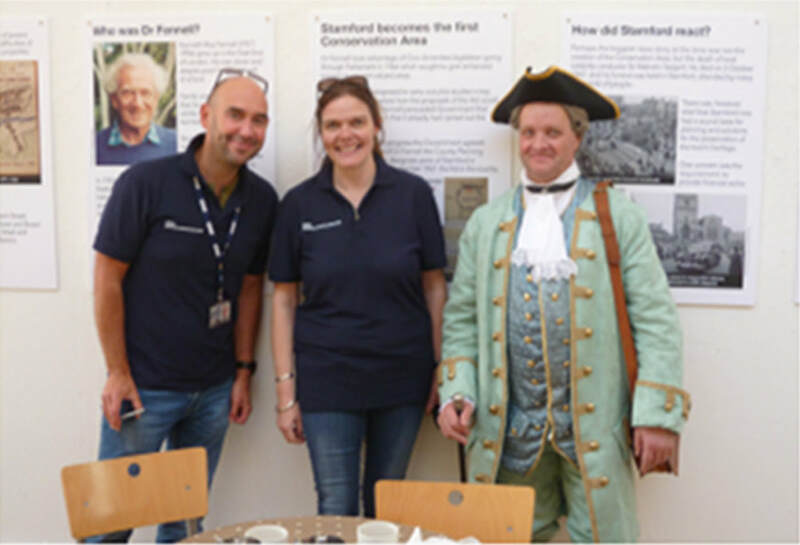 Archive photos from Historic England’s collections showed representative aspects of Stamford’s Conservation Area and we invited people to take part in a competition related to the places illustrated. ​Over the nine days of the exhibition we had many visitors who were interested in discussing aspects of life in the Conservation Area and issues raised included the impact of traffic on the town centre, the lack of a museum, and the need to make more of the railway station, for example by setting up a coffee shop or other small shops. Many conservation professionals from across the country also visited the exhibition. RIBA East Midlands Branch held a meeting at the Arts Centre and the property consultants Bidwells organised a one-day conference there with over 140 delegates. The Bidwells conference ended with a toast to Conservation Areas led by art historian and broadcaster, Dan Cruickshank. 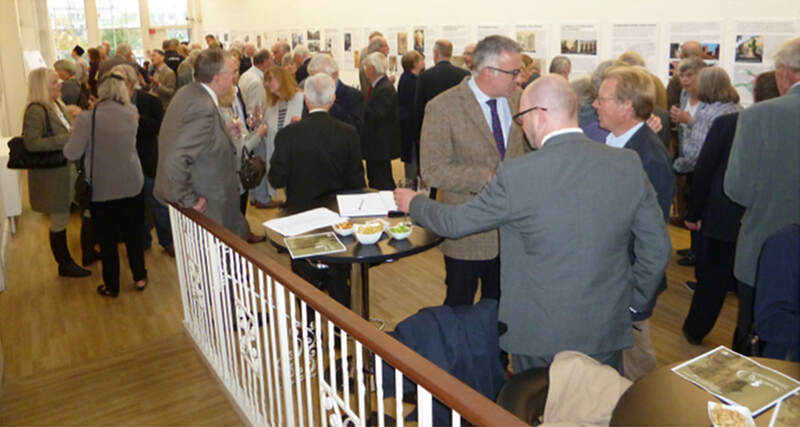 ​At the Society’s reception to mark the anniversary, Gwyneth Gibbs, our Chairman, paid tribute to those people in the 1950s and 60s who saw that Stamford and other places of historic interest were in danger of losing their identity through rapid change, and took action to try and prevent this. She highlighted the determination of local planning officer Dr Kenneth Fennell and his team who had the foresight to carry out the preliminary work necessary to demonstrate how Stamford’s historic core could be saved. ​Gwyneth also thanked Civic Society members past and present whose support over the years for the Conservation Area has helped to ensure its continued protection. ​The final part of the celebrations was a toast to Dr Fennell and we were very pleased that his son, Roderick Fennell, and family members were at the reception to hear the tribute to his father.